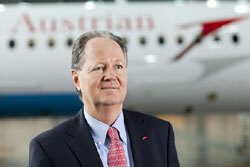 The CEO of Austrian Airlines is optimistic to achieve unified collective agreement for the whole workforce. Costs for the transfer of undertakings are expected to reach up to € 90m. By July, AUA´s workforce will automatically enter the own subsidiary Tyrolean. Jaan Albrecht is optimistic that the transfer of undertakings will be cheaper than expected. In total, costs will range from € 80m to € 90m, AUA´s CEO thinks. The severance payments amount to € 55m. This article includes a total of 199 words.